High quality preserved arrangements are each hand made using Green Banksia , Natural Brunia & White Hydrangea natural materials. They offer a lasting alternative to artificial silks. Each are hand crafted using only natural materials that were once living. Every floral design is made with the highest quality materials grown throughout the world. No artificial material is ever used. Beautiful arrangements that will last for years to come. 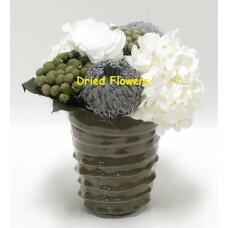 High quality preserved arrangements are each hand made using Green Banksia , Natural Brunia & Wh..